I would never have imagined that what is after all a paperback-sized atlas of radiology could work so well. The quality of reproduction of the scans is superb, and both normal anatomy and disease are well covered. The opening chapter contains tables carrying such labels as ‘Practical differences between MRI and CT’, ‘MRI presentation of head and neck pathology’ and ‘MRI tissue characteristics’. The tables are very comprehensive, and probably provide the best presentation of these topics that I have encountered. 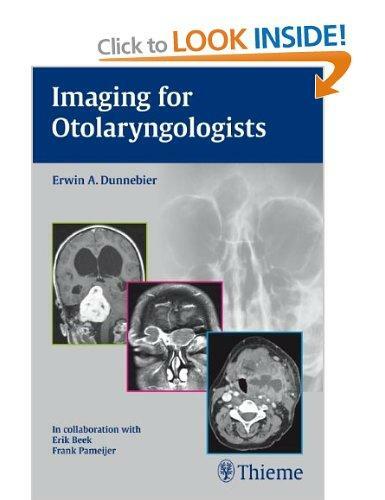 This book, from the Netherlands, is written from the viewpoint of the otolaryngologist and not the radiologist. As a result, it resists the common urge to present imaging of the bizarre or irrelevant (e.g. the foreign body in the ear canal or the sebaceous cyst in the neck). Otology and skull base material dominates, taking up the first half of the book, but the sinuses, neck and salivary glands are not overlooked. High print quality on glossy paper, at a bargain price, is what makes this such an attractive atlas of radiology. This book is a great reference for the trainee; however, as an ‘expert’ on ENT imaging, I too enjoyed it immensely.